A Rwandan genocide survivors' group has criticised the awarding of a US human rights prize to a Rwandan hotelier who sheltered people during the genocide. 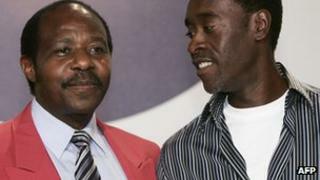 Paul Rusesabagina, who inspired the Hollywood film Hotel Rwanda, was given the prize by the Lantos Foundation for Human Rights and Justice. But the group Ibuka says he exaggerated his own role in helping hotel refugees escape the 100-day slaughter in 1994. Mr Rusesabagina now lives in exile and is a fierce critic of the government. Ibuka is close to President Paul Kagame, whose forces ended the killing of some 800,000 Tutsis and moderate Hutus when they captured the capital, Kigali. The 2004 film Hotel Rwanda told the story of how Mr Rusesabagina, a middle-class Hutu married to a Tutsi, used his influence - and bribes - to convince military officials to secure a safe escape for the estimated 1,200 people who sought shelter at the Mille Collines Hotel in Kigali. "Our problem is what they're doing, it's because of that film Hotel Rwanda - that is not a true story, " Janvier Forongo, the executive secretary of Ibuka, said about the awarding of Mr Rusesabagina's prize. "He was charging them money for those who survived in that hotel," he said. Katrina Lantos Swett, president of the Lantos Foundation, said the former hotel manager was also given the award for his "continued courage" in speaking out about political oppression in Rwanda. "The lack of democracy, the squelching of the free press, imprisonment of political opponents, these are causes of concern and it takes courage to speak out when there is a government in Rwanda that really does not brook criticism well," she told the BBC's World Today programme. Ibuka, and other genocide survivor groups, have also accused Mr Rusesabagina of having links with Rwandan Hutu militants based in DR Congo - and a prosecutor has alleged he sent money to commanders there. Mr Rusesabagina told the BBC such accusations were an attempt "to divert the international community's attention from the real problems" in Rwanda, such as its repression of the opposition. Previous winners of the Lantos prize include Tibetan spiritual leader the Dalai Lama and holocaust survivor Ellie Wiesel. "When you have someone who emerges as a compelling voice that is an irritant to a regime, very often the regime or their supporters or proxies will go to great lengths to discredit that individual," Ms Lantos Swett said. "I am reassured - I know Paul Rusesabagina, I believe he is an example to so many of us - he did what he could day by day, in his own small sphere, to try and save lives. "I think if Paul Rusesabagina had not had the determination to draw attention to some of the concerns about what's happening in Rwanda today, none of this outpouring would have taken place. "It didn't take place when the movie came out… it's when he began to speak out that suddenly many really questionable and unsubstantiated charges were raised."